Complete DJ and emcee services. The live sax during cocktails and dinner is just an added bonus. As your guests arrive, Saxman Slim will perform lively music on the sax to provide a festive cocktail hour atmosphere. After announcing the bridal party, he will tone it down with classy ballads behind dinner. As dessert is cleared, he'll put down the horn and emcee your slow dance features, before keeping the party jumping as an experienced DJ . Every wedding reception is different. A meeting will be scheduled prior to the event to discuss the itinerary as well as song selection. Someday all wedding DJs will provide live music before the dancing begins. "What a cool cat DJ and sax player! A few guests took one of his cards! He made the night so much fun!" 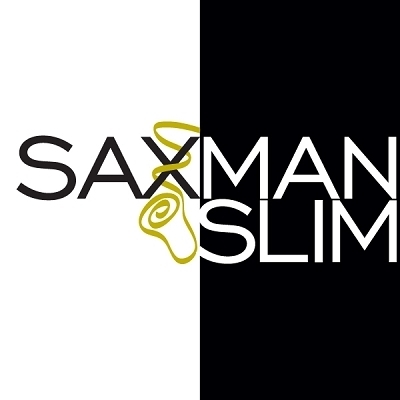 "I strongly recommend Saxman Slim. We had less than two months to plan our wedding, and so it was quite helpful that both the owner and the particular musician with whom we worked were responsive to our inquiries, including several adjustments we made along the way (such as adding more time and changing some particulars about the format). The musician was helpful selecting music and determining our needs for the available space and time (we met with him in person and also communicated via phone and e-mail). Many guests commented on how good he was when he played his saxophone as guests were arriving and waiting for the ceremony to begin. For the reception, he played the songs we had chosen, was very responsive to requests (there was no request I made that he could not meet), nicely wove in some saxophone with the recorded music, adjusted the volume so that guests could comfortably converse without being overpowered by the music, and was comfortably interactive with our guests." "Steve from Saxman Slim performed during our cocktail hour, and occasionally during the later part of the evening, and then DJ'ed the whole reception. We absolutely loved him! He was really flexible during all our crazy wedding planning and met with us when it was convenient for us, and went over everything. He always answered my emails promptly, and made sure we had everything set up exactly how we wanted for our special day. He played all the songs we asked him to, kept things moving, kept the crowd engaged, and overall made the night into a really great party! The sax music was elegant, yet upbeat, and we got many compliments from our friends and family because it was "something different" and made our wedding stand out. Steve did a great job, and we were really pleased we chose him for our wedding. " "Well, it's been 6 months since the wedding, so we've forgotten quite a bit. The one thing we haven't forgotten, however, was how amazing Steve was as Saxman Slim. We received endless compliments from party guests about his performance. He is a phenomenal saxophone player, and did a great job of tailoring his DJ music to what we, and our guests wanted. He was a great emcee during the toasts and introductions. Our one-on-one meeting in his home was incredibly fun and comfortable. Suffice to say, there are not enough great things I can say about Steve."